Wow, things have been super busy since we got back from vacation. Between work, super-cleaning our place, and our company this past weekend, we've barely had a chance to catch our breath, let alone blog. Last weekend was jam packed. Charles' parents stopped by on their way home from a business trip and were able to spend the weekend with us. Saturday we went to Easton, where I finally remembered that I really, really wanted a Betty Crocker Cookbook. 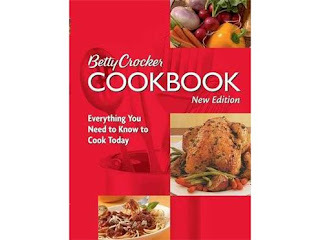 I can now say I am the proud new owner of the Betty Crocker Cookbook. Not only do I have tons of new recipes to try out on Charles, but I have access to every kind of cooking method for any kind of meat, along with the health department recommended serving temperatures. I'm pretty sure, that if needed, I could successfully butcher my own cow, by solely referring to my cookbook for instruction. 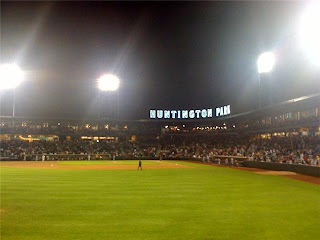 After Easton we headed to Huntington Park for a Clippers game. Our seats were in the bleachers, but were nonetheless great seats. This was my fourth trip to Huntington Park and probably one of the most entertaining, no thanks to the Clippers. (If you follow me on twitter, you already know about the guys who sat behind us.) The opponent and dominator of the game was the Toledo Mud Hens. They managed to score in 8 of the 9 innings and hold the Clippers to 1 run. The final score was 16-1. I don't think in the four games I've attended I've seen the Clippers win, or have the lead for that matter. Needless to say, we thoroughly enjoyed the game and were able to see the players acquired from the Indians' recent trades of almost all of our talent. Oh, and one more plus of the night... I was able to see the park lit up for the first time. It wasn't quite as exciting as I would have hoped for. There was an elderly gentleman sitting in a plastic chair out side of The Rug. 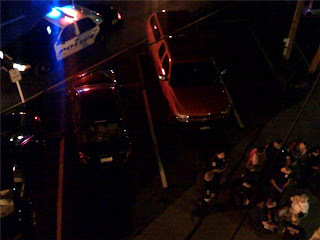 I was hoping for a fight or something, but alas, I think he just sprained his ankle. My real question was "What was he doing at The Rug in the first place?" I didn't even stick around to see if he went in the squad or not. The Rug incident reminds me. Now that I've been able to secure my cookbook, I should move on to the next item I've had my eyes on, a police scanner. Charles isn't too happy about the idea of getting one of these. Sunday was spent at church and getting ourselves locked out of our place. Worried that we'd have to call our landlord who lives at least 40 minutes away, I remembered that I hadn't been able to lock the laundry room window. Once Charles had jumped the back fence and let us in we headed upstairs to try to pry open the screen so they could push me through the window. The screen lifted in a matter of milliseconds and soon I was being lifted up and pushed through the window. My legs managed to clear off any dust that had accumulated as well as collect a couple of bruises along the way, but we made it in and now I have another project this week... get a set of spare keys. Once Charles' parents hit the road I went to town cooking for our church pool party. It was a little chilly, but we still had a good crowd. Our weekend ended around 10:30 Sunday night and we happily hit the hay. We had a blast with the Elseas and are looking forward to seeing them again in two weeks for the OSU v. NAVY game. On a side note, I ate lunch at Chipotle today. I usually never, ever do that. This post has been edited by Charles Elsea for grammatical correctness.